Your summer getaway to a national park might not be quite the pristine nature vacation you had in mind. The report, “Polluted Parks: How Dirty Air Is Harming America’s National Parks,” examined 48 national parks across three categories: ozone levels, haziness and the impacts of climate change. It concludes that 36 out of the 48 parks have unhealthy air at times, with the 12 parks most harmed by air pollution all having unhealthy air at times and regularly blanketed by haze that reduces the visible scenery. On average, park visitors can’t see 50 miles of scenery—the length of Rhode Island—due to haze pollution. Each of the 12 parks earned grades of “D” or worse in at least one category. 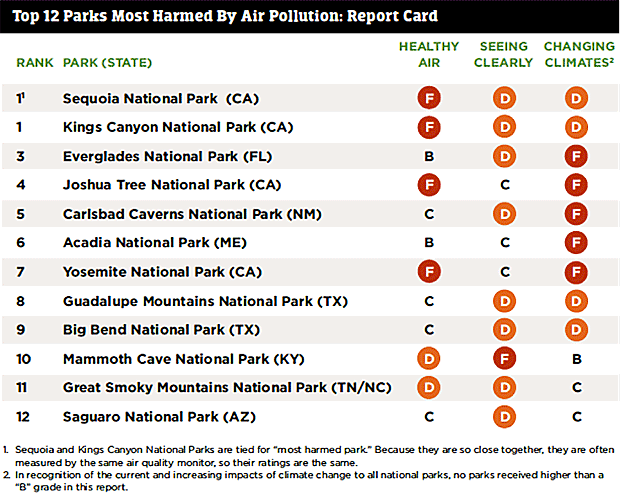 Sequoia National Park and Kings Canyon National Park tied for the title of “most harmed park” with failing grades for healthy air and Ds for visibility and changing climate. Everglades National Park in Florida came in second, followed by Joshua Tree National Park in California, and Carlsbad Caverns National Park in New Mexico. 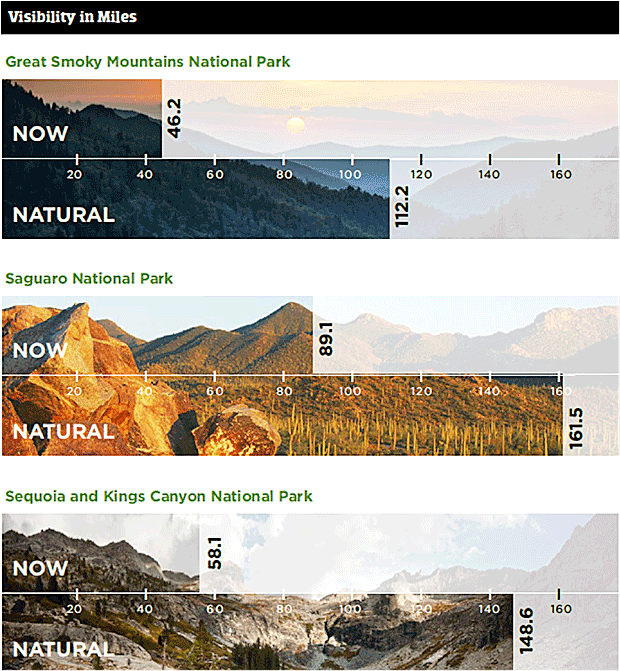 The National Park Service recommends that park goers check the air quality of any national parks they plan to visit by consulting Airnow.gov, using the NPS website and looking up air quality in nearby zip codes. Some of the parks, such as Rocky Mountain, Sequoia and Kings Canyon, also send out alerts and advisories on social media. The parks do play an important role in preserving the environment. The National Park Service and the United States Geological Survey say that national parks in the lower 48 states absorb carbon dioxide emissions equal to 3.1 million passenger cars annually, a pollution reduction equivalent to removing all the cars from Oregon, Kansas and West Virginia. Suelain Moy is Senior Editor for Life + Money, covering personal finance, travel, food and health. A journalist and author, her work has been published in major magazines and news outlets including Entertainment Weekly, Good Housekeeping, Parenting, BabyZone.com, The Mid and the New York Daily News. She earned a B.A. in English from Yale.